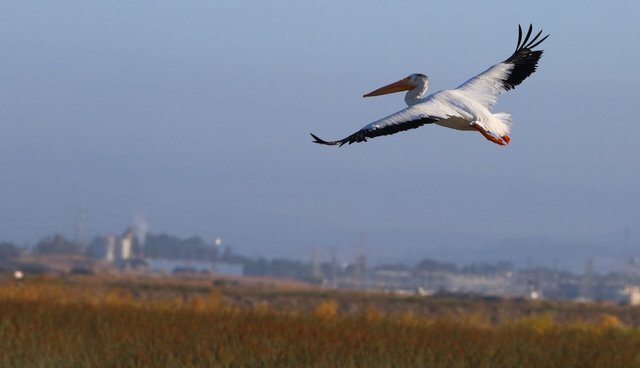 As California continues to reel from its worst drought on record, having gone nearly two months without rain, helpful humans are doing their part to make life a little easier for wetland birds. Dozens of rice farmers in California's central valley, working in partnership with the Nature Conservancy, have agreed to rent out 10,000 acres to be used as "pop-up" wetland in the otherwise parched region. Normally, farmers would drain their flooded fields in January to ready the soil for next season's planting -- but this year, they will let the water stand a few months longer to serve as resting ground for passing birds. According to the Nature Conservancy, only 5 percent of historic wetlands remain along the Pacific Flyway, a migratory route taken by thousands of ducks, cranes, geese and other birds on their journey south. "It's like stopping on a road trip so anywhere that they can find habitat and find things to eat to put on fat for their journey, they'll stop," says biologist Mark Reynolds. "California is really the linchpin of the Pacific Flyway."